Event-driven investing strategies have been around for decades. These strategies attempt to profit from market inefficiencies that often occur in conjunction with various corporate events such as mergers, acquisitions, spin-offs, stock splits, buybacks, IPOs, insider buying, and other activities that are neither fundamental nor technical in nature. 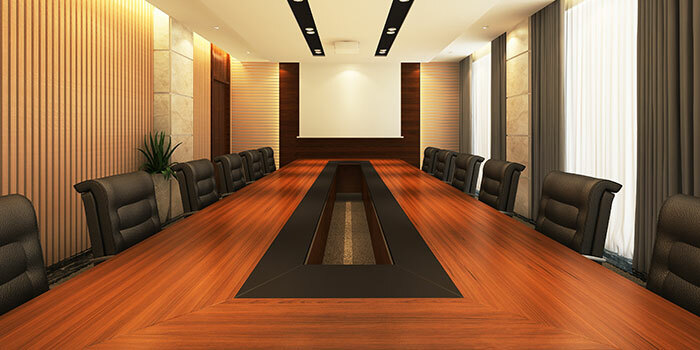 Mergers and Acquisitions (M&A): M&A funds typically employ an arbitrage strategy of buying the firm being acquired and short-selling the acquiring company. 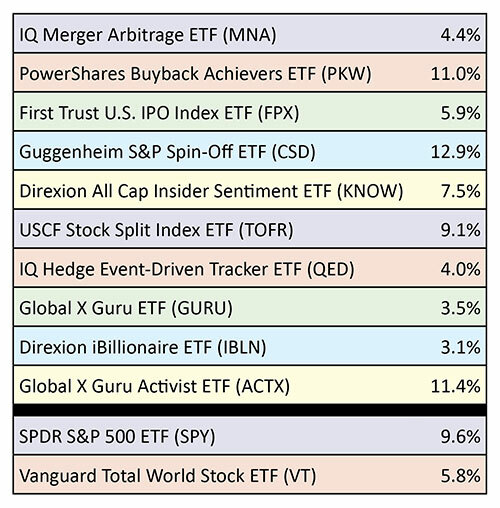 The IQ Merger Arbitrage (MNA) is currently the best representative in the ETF space. Buybacks: Companies often buy their own stock when they believe it is value priced. Additionally, earnings per share and other metrics can increase due to the removal of shares from the market. PowerShares Buyback Achievers (PKW) is a good example. IPOs: I’m sure you’ve seen countless stories about stocks zooming in value on the first day of their initial public offering, or IPO. Unfortunately, funds like the First Trust U.S. IPO Index ETF (FPX) do not capture those big first-day pops. Instead, they buy these new stocks shortly after their IPO with the hopes that they will continue to rise. Spin-Offs: A company that is spun off from its parent is often able to improve its profits due to having a more focused objective and less corporate constraints. The Guggenheim Spin-Off (CSD) holds U.S. stocks that were spun off in the last four years. Insider Buying: When corporate insiders alter their usual buying and selling patterns of company stock, it can often provide insight regarding future profitability. The Direxion All Cap Insider Sentiment ETF (KNOW) attempts to exploit these events. Stock Splits: Back in the 1990s, any company splitting its stock was nearly guaranteed to move higher. That strategy hasn’t paid off in more recent years, perhaps due to a dearth of splits, or perhaps because investors started to realize splits were nothing more than an accounting gimmick. If the strategy proves to be profitable again, then the Stock Split Index ETF (TOFR) could work for you. Multi-Event: I am not aware of any ETFs that currently try to include a wide range of events, but the IQ Hedge Event-Driven Tracker (QED) attempts to replicate an index of event-driven hedge funds. Please note that this ETF does not use any of the event-driven strategies outlined above. Instead, it attempts to replicate the risk-adjusted characteristics of a hedge fund index by investing in various combinations of stock and bond ETFs. See Related Article: Which approach do you prefer: ‘Active’ or ‘passive’ investing? When it comes to classification, some ETFs fall into a gray area. For example, there are many investment strategies based on analyzing 13F filings, which are the quarterly holdings disclosures of institutional money managers. These ETFs attempt to replicate the top holdings of various investors such as hedge fund managers via Global X Guru (GURU), investment billionaires via Direxion iBillionaire (IBLN), and activist investors via Global X Guru Activist (ACTX). These are based on investor events instead of corporate events, although the 13F filing is probably a corporate event. Anyway, these types of funds are usually classified as theme-based or strategy-driven ETFs. All of these ETFs were created because they were believed to represent good long-term investment strategies. Sometimes that is true, and sometimes it is not. However, even if the long-term results are great, keep in mind that they will all go through extended periods of outperformance and underperformance, so be sure to define your selling criteria before you execute your purchase order. Then, when you do buy or sell, be sure to use a limit order because many of these ETFs are lightly traded. Ron Rowland is the founder and former executive editor of the online investment advisory services All Star Investor and Invest with an Edge. He is also a former portfolio manager for Flexible Plan Investments. Quoted widely in the financial press, Mr. Rowland is an industry expert for insight on sector rotation and actively managed ETF strategies.